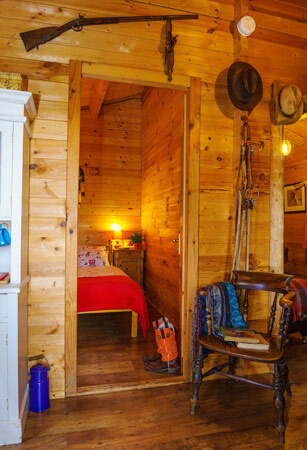 Today's featured small space is a sweet little cowboy cabin. This cabin's location was a surprise to me. I'd expect to see it in the US West. But, nope. Today we're saddling up and riding to a working farm in the Black Mountains of Wales to tour this holiday rental. John and Sue, the owners, work with horses. 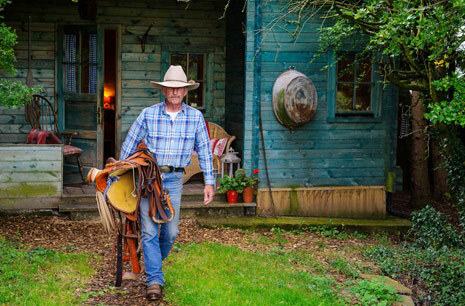 John is known as the "Horselistener". Climb down off your hoss and we'll poke around. Of course, first we'll have to stop and check out the inviting front porch. I have my eye on that beautiful patchwork quilt. We enter into the kitchen. And a mighty pretty little kitchen it is. All dressed up in red, white and blue. The wood burner keeps the cabin warm and cozy. 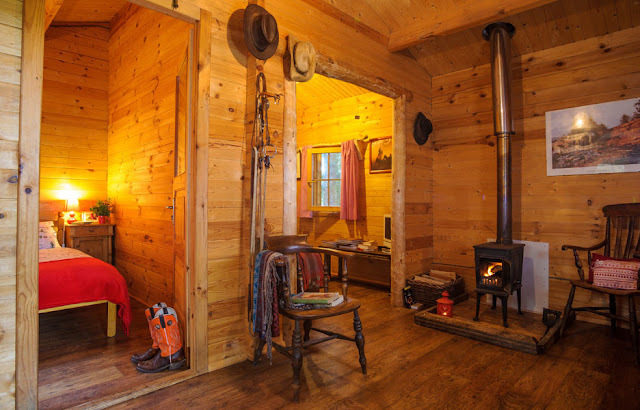 Western art and cowboy gear fill the cabin. The bedroom continues the red, white and blue color scheme. 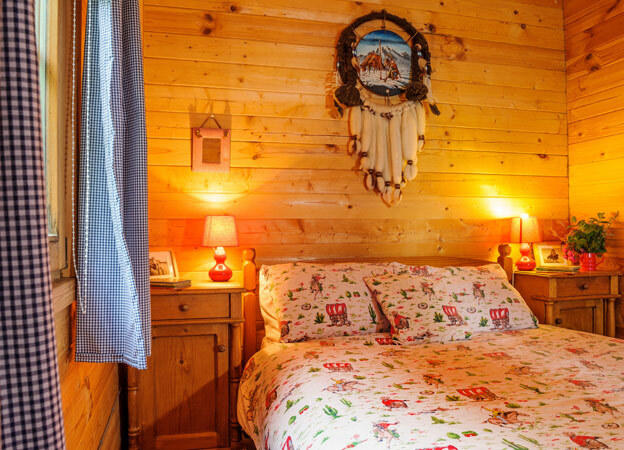 A cowboys and covered wagons pattern on the bedding keeps to the western frontier theme. This is such a fun space. The living room adjoins the kitchen. Two big leather chairs in the living rooms offer a place to read or watch TV. Or snuggle under one of the throws and dream. 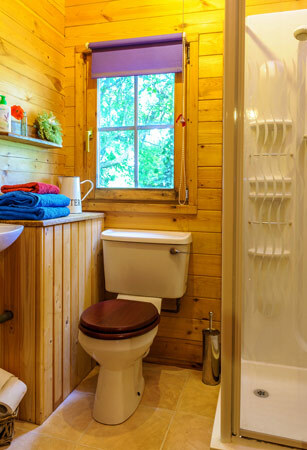 All the walls in the cabin are wood paneled, including the bathroom. If the weather is nice, kick off your boots and relax in the shade. 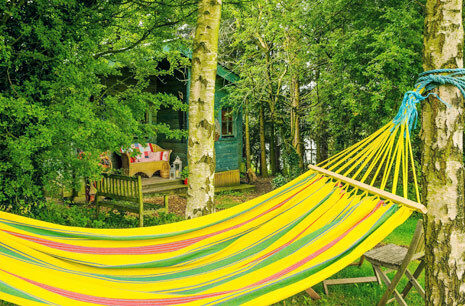 A perfect spot for a siesta. Okay pardner, before you skedaddle, tell me what you think of Wrangler's Rest? 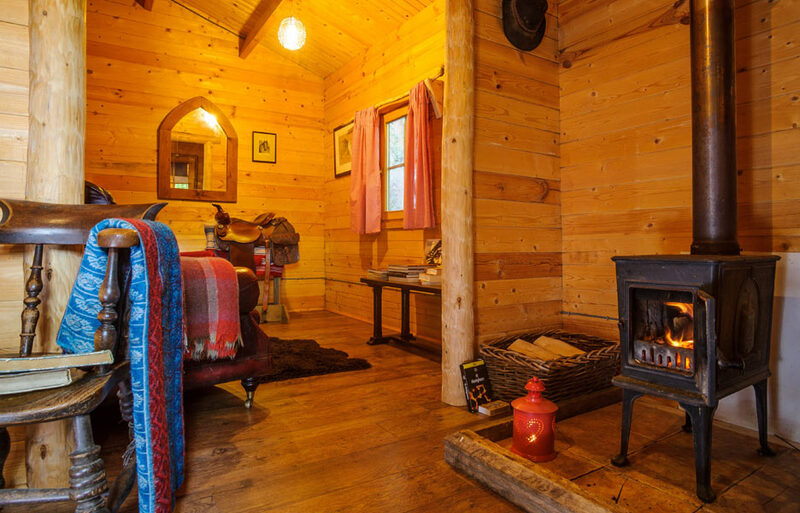 I love it and still can't believe you found this adorable cabin in Wales of all places. It just goes to show that, "You can take the cowboy out of the west, but you can't take the west out of the cowboy." The sheets on the bed and wonderful. I wonderful if they made them, or found a place to order them. As for you young lady 51 small homes that in quite an accomplishment. I absolutely love touring these small spaces with you and enjoying the enthusiasm that shines through in you writing about them. Here's wishing you a lovely weekend. Happy Saturday, I love your series. #51 is completely unexpected and cute as can be. You are right, Nancy....what a surprise! And how cute! So adorable - it's like a warm hug inside. 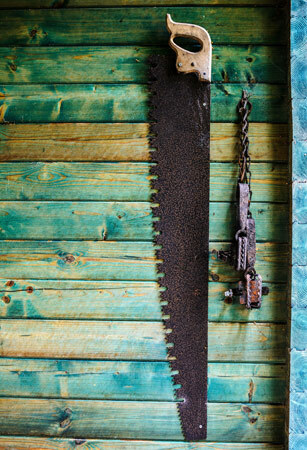 And I love the turquoise weathered siding on the exterior. Great description, Sally! I love the exterior color, too. It was a pleasant surprise to find this little gem. Glad you like it, Barbara. So cute and to be in Wales wow!!! 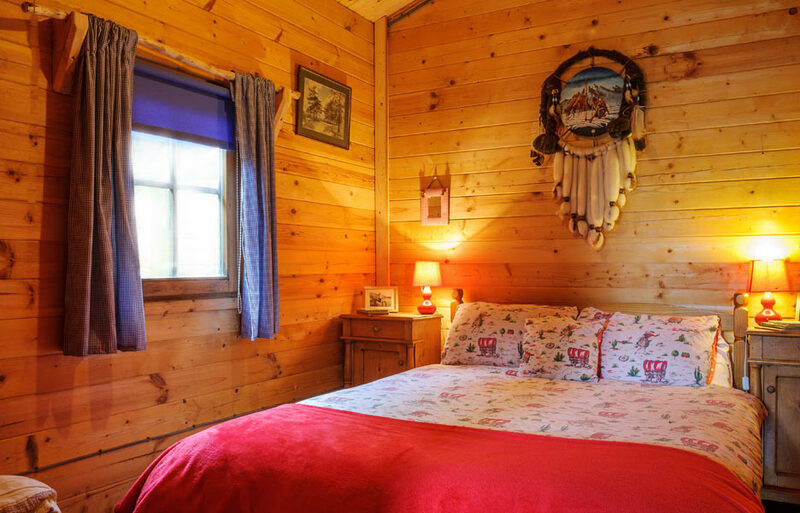 I love the western theme and how warm and cozy this little cabin is. 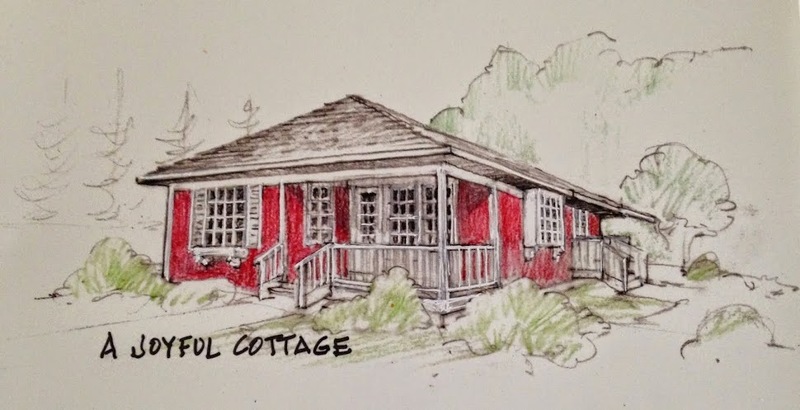 Thanks for sharing another great cottage with us Nancy. Have a great week end. 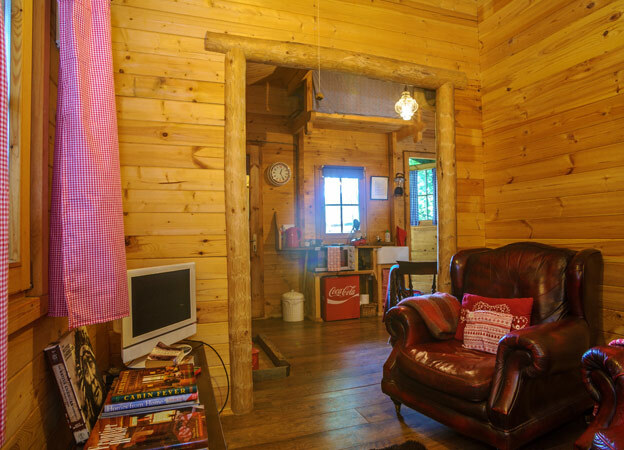 It's a well-designed cabin. I love all the wood and the bright accents. I could easily live there. What kind of storage areas does it have? Any closets? Super cute little place! Have a great weekend Nancy! 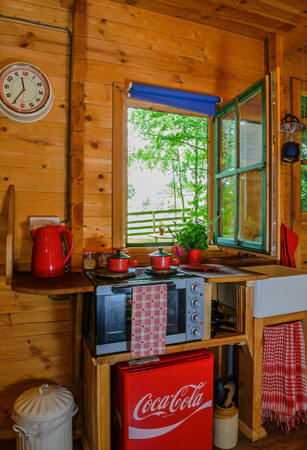 That cabin is so cute and you are right I thought it was in the west too. Super sweet and I love that it comes with its very own cowboy! ;) That white hutch is my favorite piece, right after that lovely quilt. That white hutch is wonderful. The whole space is really charming. Thank you for sharing. No matter how small, there is such a charm in this place. I hope there is a horse somewhere outside because that would make it COMPLETE for me! OHHHHH the tiny little furnace is adorable. HI NANCY! I could LIVE there!! So cozy and I love the red, white and blue color scheme. Just one question....are those boots included?! Absolutely love this! 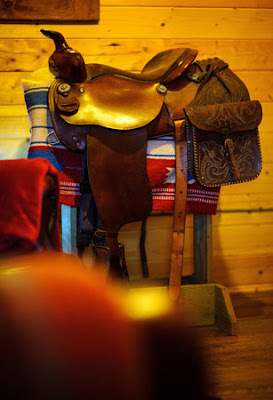 Very "Texan" in a sense ~ :) It looks so warm and welcoming ~ a great place to relax and let the world go by. Well I think it is absolutely darling! Could just snuggle up and stay there quite some time. Love the blue stain on the outside! Wrangler's Rest is a delight! It would be so much fun to stay there. Like playing house, cowboy style. Oh wow! That's such a sweet,charming space! I bet it would be really nice to stay there. Is it in the middle of the woods? I love your blog! I haven't visited it before, but found it on my quest to comment on 300 blogs in 30 days. I'll definately be returning! Hello and welcome, Linda.. I'm glad you found my little blog. Thanks for visiting and for the nice comment. 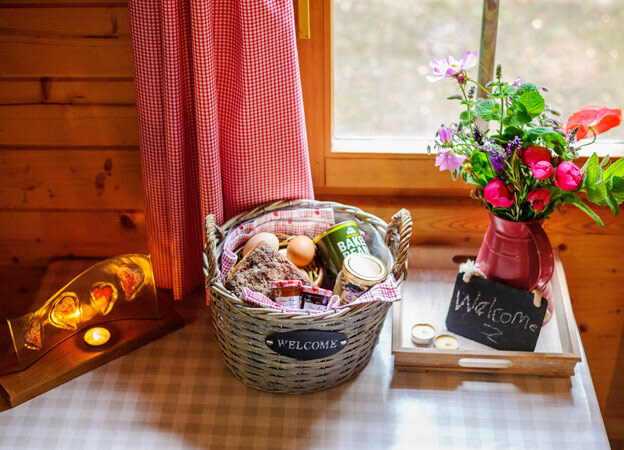 Just catching up and so glad you shared this darling little cabin. I thought for sure it must be in your part of Oregon! What a surprise to hear that it's in Wale's. I love everything about it. 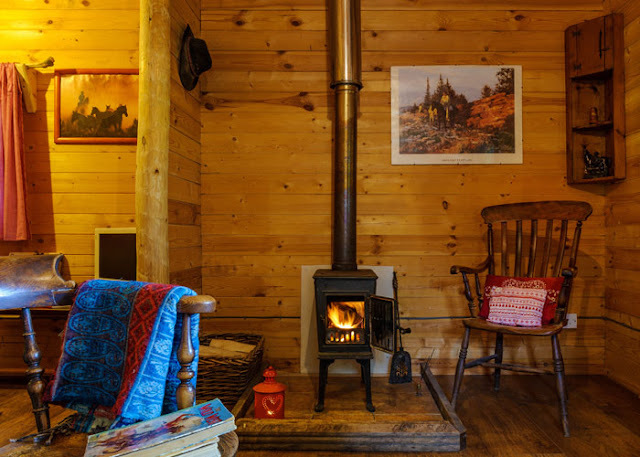 I could imagine snuggling up in front of the fire with a good book. Rustic and Real... real cute that is! 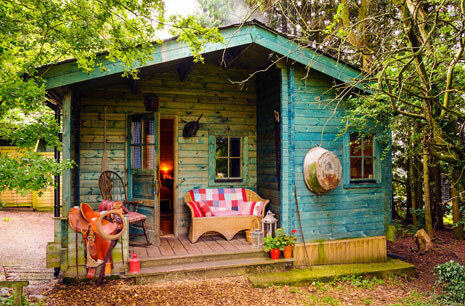 This is an adorable cottage and I love the colour of the outside as well! Fun colors! I love the bathroom. It very much does look like someplace you'd find in the US West. I love the wood, the place has so much character! Such an adorable place. 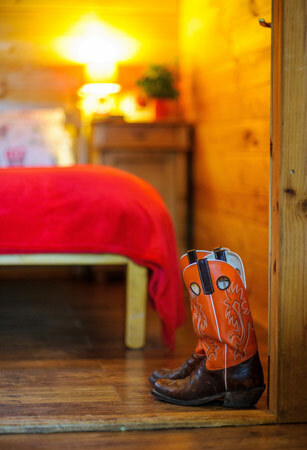 It had me at turquoise and cowboy as I love decorating with both. A few years ago I did a cowboy Christmas tree. 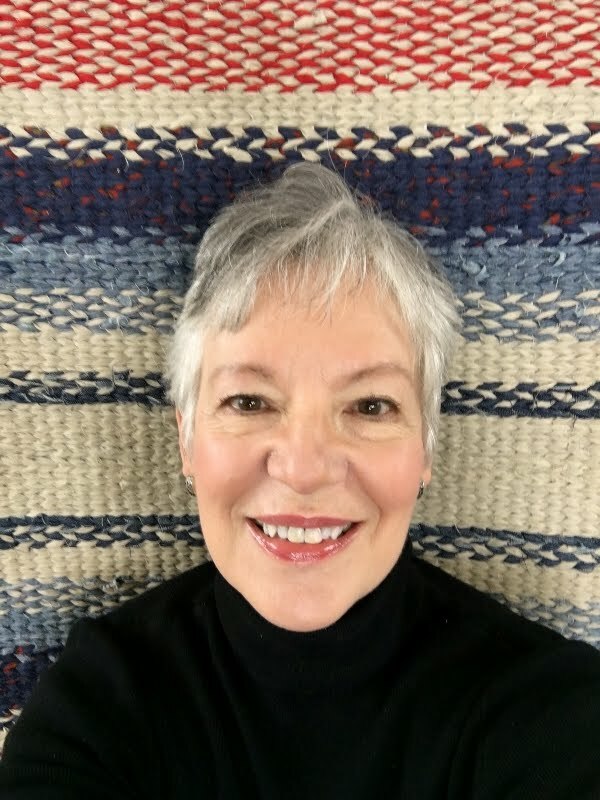 Thanks for visiting and for your kind comment on my Saturday Spotlight and our Fall kitchen tour! I don't know how you find all these cute homes to share, so darling! I love everything about this little jewel starting from the very first glance. The way the outside is painted is just so charming! I love that exterior color, Gigi. 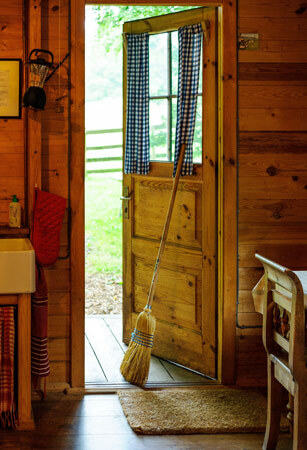 What a cute little rustic cottage. 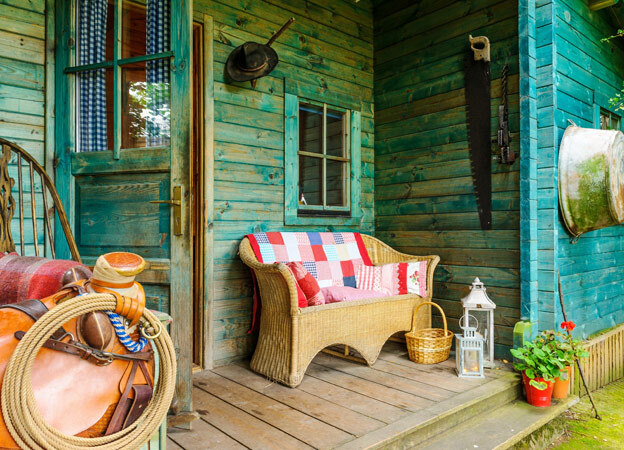 I especially love the charming porch and the wash on the outside wood. How adorable! The red, white, and blue are perfectly bright complements to the warm, honey hued walls of wood! 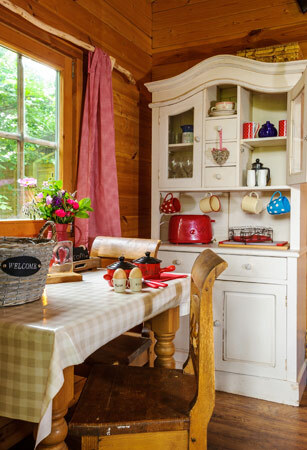 I could cook in this charming kitchen all day; it's so sweet and pretty! Thanks for featuring this small space with big, welcoming appeal! What a darling place! And it looks quite comfortable as well. 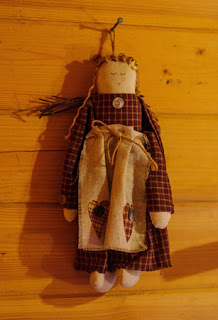 I love that little angel doll in the last photo. Love it! It's oozing with charm! The color of the exterior grabbed me immediately.